I think my crazy summer pace is finally catching up with me. I feel positively... spent. Ready for fall. Ready to slow down. In my mental calendar there are only a couple of weeks until summer's over... I'm using my brother's wedding as my marker. We had a fantastic time in Connecticut with the fam, as always. Fenwick isn't my kind of beach exactly - the water's cold, there's not much sand, but wow is it pretty. 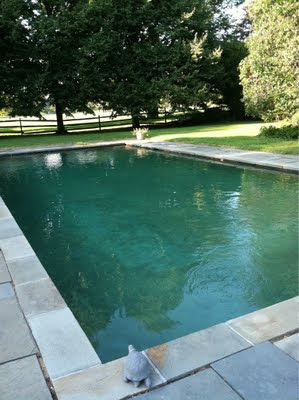 Here's the pool at T's stepfather's family house, where I clocked in quite a bit of time this weekend. I'm not much of a backyard pool person, to be honest, but this pool? This pool is my favorite backyard pool ever. Why yes, the pool does back up to a golf course. As well as the church where T's mother and stepfather got married... which people drive to every Sunday morning via golf carts. And yes, that was me happily swimming while the blonde masses went to church. Heathen, I am. A tired one.